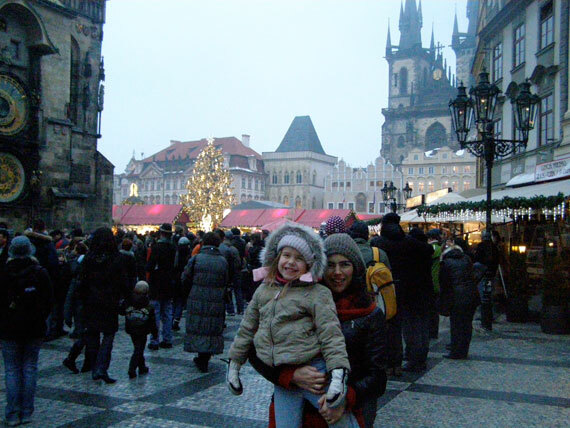 Kids in Prague | Whats on in November? After the excitement of Halloween and the approach of Advent and Christmas, the month of November can often be dull and unpleasant - just like the weather! 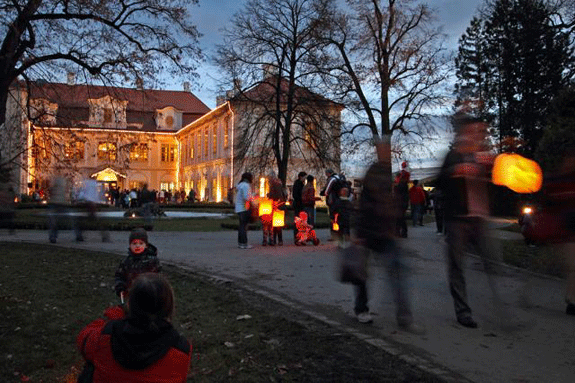 But, there are some fun and interesting things happening around town this month, in particular there is Saint Martins Day associated with great feasts and colourful lantern parades both perfect activities when the evening darkness descends. 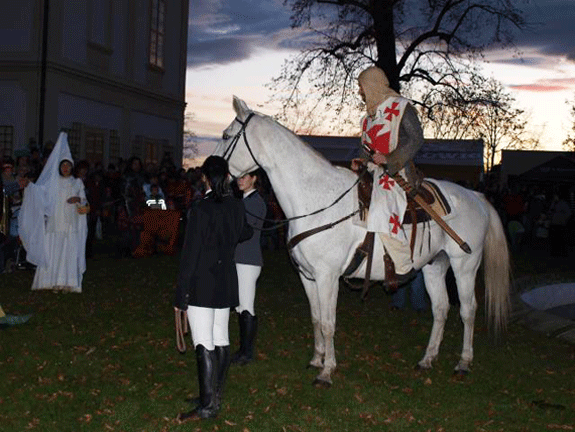 The Feast of St. Martin is celebrated in many European countries and falls on November 11. St Martin’s coincides with the wind down of agricultural activities as the growing season ends; the crops have been harvested and animals fattened for consumption. In the past it would also fill people up and prepare them for the 40 days of fasting over the Advent period. In the Czech Republic Roast Goose is the traditional treat and weather-wise there is a proverb connected to the day - ‘Martin přijíždí na bílém koni’, which translates as ‘Martin is riding in on a white horse’ - the first half of November is usually the time of the first snow falls. In the coming days keep your eye out for restaurant and weekend brunch offers serving typical St Martin’s delicacies along with a selection of young wines. The farmers markets (in particular the markets at Náměstí Jiřího z Poděbrad) will also be organizing their own St Martin foods and activities too. 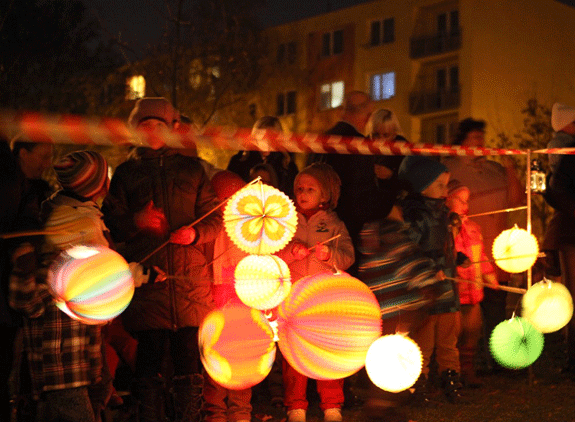 You’ll also notice that many kindergartens and Family Centres stage Lantern Parades for children through local parks in the lead up and on the day of St Martins. Our local Kindergarten uses this opportunity for the children to say goodbye to the nature (trees, animals) as they shut down for hybernation over the long winter months. 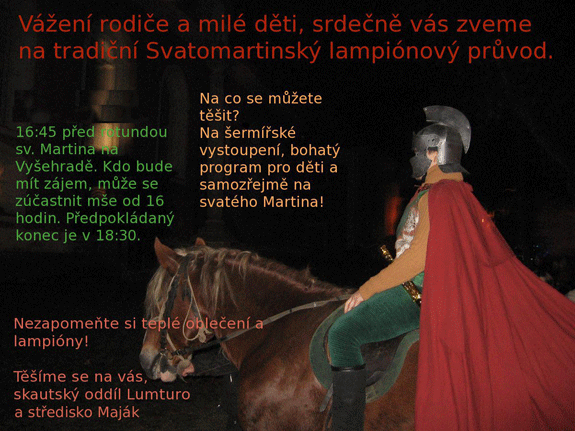 One of the major parades in Prague with a program for children and St. Martin will also be there on his white horse. Assemble at 16.00 with your lanterns and in warm clothing at the St. Martin’s Rotunda. At 16.45 the lantern parade will begin and event concludes at 18.30. The Chateau has organised a lively, festive program full of dancing, singing, juggling and acrobatics show, games and fairy tales. Dress as a knight to receive knighthood training. The Chateau has it’s own restaurant where you can have the traditional St. Martin’s goose as well as a wide choice of young wines to taste. You can book ahead to reserve a table and you can even stay overnight at the Chateau hotel. Read our review of the Chateau here along with links and a map showing you the location from Prague. Free tours of all current, permanent and short-term exhibitions plus a small farm with domestic animals. Historical agricultural machinery - tractors etc. on display in the parking lot. 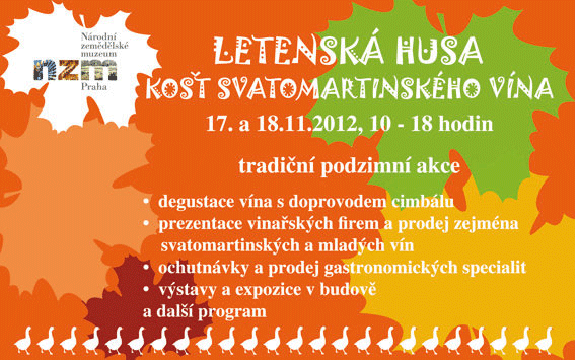 Demonstrations of old Czech crafts and skills, presentations, tastings and sales of gourmet specialties inc. goose delicacies, accompanied by wine: St. Martin’s and young wines prominent Moravian and Czech wine producers. Dulcimer Music performance at 11:00, 13:30 and 15:30 pm (lecture hall on the ground floor) and a program for children will be held in the courtyard plus there is a new indoor kid’s play area within the Agricultural Museum. TICKETS: full admission (adults 18 - 70 years) - 100czk, reduced admission (children and young people from 120 cm to 18, seniors over 70 years) - 60czk, free admission (children up to 120 cm). Happy Mondays at Prague Zoo - 1czk entry to mothers with children in prams and baby carriers every Monday during the month of November. Storytelling - Class Acts have storytelling and a puppet show on Saturday 10 Nov in Kampa Community Centre (book via Class Acts) and storytelling at Korunni Public Library in Prague 2 on Wednesday 21st Nov - free event and does not require registration. Magician Show and Magician Workshop - both at Amadito & Friends - Sat Nov 10 is a Magic Show, Sat Nov 24 is a Magician Workshop for older kids. Register with Amadito & Friends. Kids Afternoon of Yoga, Art and Drama - on Sun 18 Nov at Wellness Yoga Studio in Prague 2. Register with Lucie at Wellness Yoga. For additional ideas on what’s going on in November check out our November Events calendar and also keep an eye out on our Kids in Prague Facebook page where we regularly post last-minute events and activities that we find out about. So there you have it, I hope I’ve convinced you that November doesn’t have to be so dull after all! Oh and finally, don’t forget to mark your calendars for the lighting of the Christmas Tree in Staroměstském Náměstí (Old Town Square) set for Saturday 1st December at 17:00!! !